One does not need to review the electric vehicles (EV) sales statistics to realize that the segment is booming. By looking around as you drive to work, to pickup the kids, or go somewhere fun (for those of us without kids) you’ll notice that EVs are taking over our streets. Before jumping into the good news, it’s important to remember where we came from. Turning back the clock to a few short years ago, plug-in EV sales were a fraction of what we see today. As an example, 2013 EV sales in Canada totaled over 1,600 for battery EVs (BEV) and plug-in hybrid EVs (PHEV) each. Since that time the market has only seen temporary leveling of a month or two. Annual numbers have always built upon previous years as the market continues to grow. 2017 is a perfect example of that fact as sales stats half way through the year are up 70% over the first half of 2016. 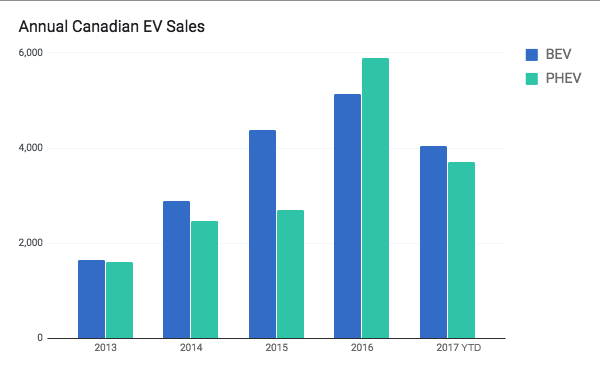 With the trajectory of sales only heading up and at a faster pace, Q2 may be the quarter where the EV takeover became official. As the market heats up, manufacturers continue to jump in with new models. 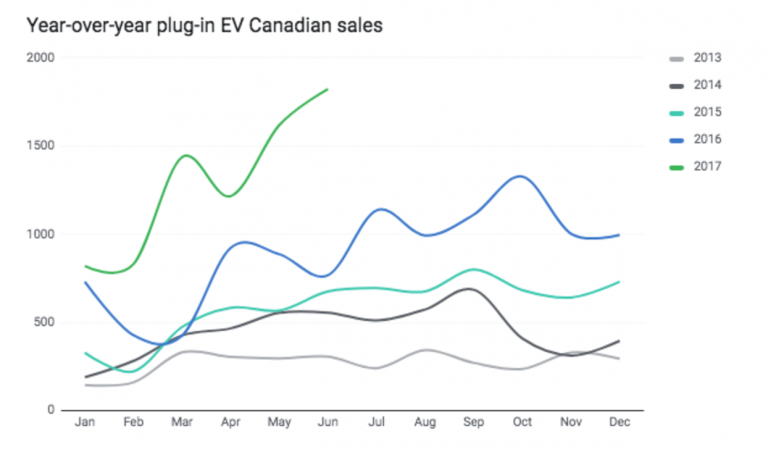 The total number of EV models in Canada is now at 40. Four of those were introduced within the last months alone. The Hyundai Ioniq all electric battery and plug-in hybrid, Kia Optima plug-in hybrid, Mini Cooper S E, and albeit not completely new, the PHEV Toyota Prime (now named Prius Prime) landed in June. Thanks to Jeff Turner for tipping us off on the fact that the Hyundai IONIQ has performed extremely well in Canada, with over 200 sales through to the end of June. That may be the first time a model has outpaced the sales of the US market. Clearly there is a concerted effort to “push” inventory in the Canadian marketplace. I have a feeling fellow Canucks are more than happy to take possession of that inventory. At the end of Q2 2017 nearly 37,000 electric vehicles have been sold in Canada. The total number of new EVs sold in Q2 2017 totaled nearly 5,000. This represents almost 1,600 more EVs sold in Q2 across Canada than in Q1 of 2017. That acceleration in the rate of new EV sales has continued through the entire half of Q2 with June setting a new record of 1,824 sales. The split between all electric battery EVs to plug-in hybrid EVs is half and half. 969 of the 1,824 Q2 EV sales were of BEVs. Read the entire analysis on the FleetCarma blog.